Isaiah was the production assistant (PD) who reported to the first assistant director (AD) in charge and when the first AD wasn’t around, he got to be in charge. He also noted that he had the opportunity to be an extra in the film as well. “Having actual experience on a movie set is invaluable for anyone in film school. It is almost impossible to simulate the controlled chaos of a movie set in the classroom,” said director and former IPR instructor, Wayne Johnson Jr.
Wayne continued by commenting that this also gave the students an opportunity to interact with working professionals, ask questions and network. “I made awesome connections with the first AD and might even get future work out of it! I also met some extras that I could use in my future work,” said Isaiah. 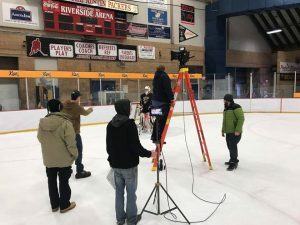 The film is currently being filmed at the Riverside Arena in Austin, Minn. 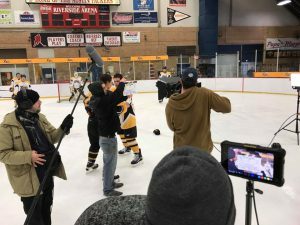 The film has also been shot in other locations throughout Minnesota and Wisconsin. “Without the help of the IPR students we would have started shooting late and the entire day would have been much harder. Their contribution was greatly appreciated,” said Wayne.